Blackfish Lodge, British Columbia, Canada. 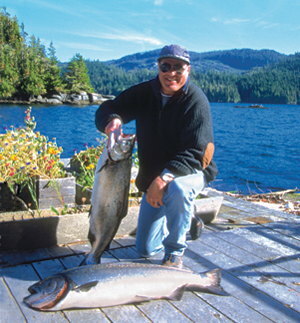 Wilderness fishing lodge in BC's Great Bear Rainforest. Blackfish Lodge, British Columbia Wilderness Fishing Lodge. Quality freshwater and saltwater fishing --- spectacular location --- easy access --- and more! about 30 miles east of the northern end of Vancouver Island. and the ability to utilize spinning and casting techniques. You get great fishing opportunities for all skill and experience levels. On your guided fishing trip there are no pre-set fishing hours - we fish as conditions and your preferences guide us. Personal service is assured by the limited number of guests that we take. We will guaranty exclusive use of the lodge for parties of six. 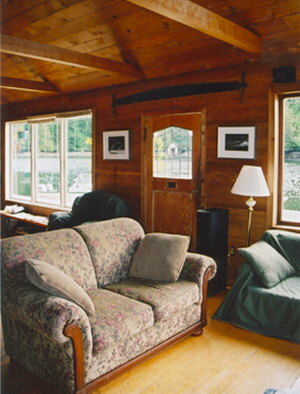 Warm and Comfortable Atmosphere -- whether on a salmon or freshwater fishing trip, it all begins when you walk into the lodge. You'll be greeted by the scent of cedar, and lunch will be on the table shortly. At the end of your day of fishing, come home to the relaxed and personal atmosphere that defines Blackfish Lodge. The fireplace will warm, a glass of your favorite beverage and our fine and sumptuous food will satisfy. You'll drift off to sleep hearing the sound of water lapping outside your window --- quietly aware that tomorrow will bring new angling delights. and Blackfish Lodge is situated to take full advantage of the presence of these fish. Trolling is the method of choice and, year after year, our guests really appreciate how consistent our fishing remains. Our area is also home to some excellent BC halibut fishing, with some spots within just a few minutes of the lodge. 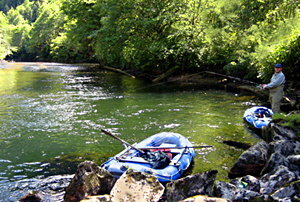 including some fine lakes and streams on nearby Gilford Island. Fish small streams or bigger water, dry flies, or wet ... and depending on the time of year you'll find yourself hooking summer or winter run Steelhead, Cutthroat Trout, Dolly Varden char, a few Rainbow Trout, and Chinook, silver, and Pink Salmon. 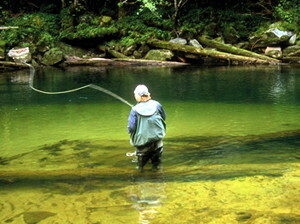 Spinning and Casting - fish any of our streams, rivers, and lakes using spinning and / or casting gear. Steelhead fishing, trout fishing, salmon fishing, and Dolly Varden fishing are all very productive, and all fish respond extremely well to a cast lure. Our freshwater fishing spots are located from a 20-50 minute boat ride from the lodge. Explore pristine saltwater lagoons, go whale or bird watching, or enjoy a picnic lunch in the Burdwoods, one of the most unique spots on BC's West Coast. 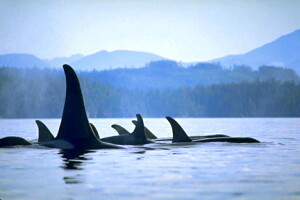 The waters of Blackfish Sound, Johnstone Strait, Knight Inlet, and Kingcome Inlet are home to a large and famous concentration of orca whales and other marine mammals. Bald eagles are a very common sight as are ravens, kingfishers, and herons as well as bears, deer, mink, otter, and beaver. Visit a First Nations woodcarver and purchase wonderful masks and carvings directly from this skilled craftsman. This region has a rich native heritage and there are sites displaying rock paintings, burial grounds, old villages and many other aspects of British Columbia's coastal Indian history. 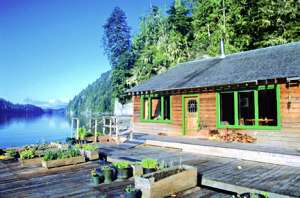 Accessible by boat or floatplane only, Blackfish Lodge is truly a place of seclusion, quiet, and contemplation. Our custom built BC floating lodge is your cozy home base for delightful days of experiencing stunning Canada wilderness scenery, abundant wildlife and, of course, great fishing.